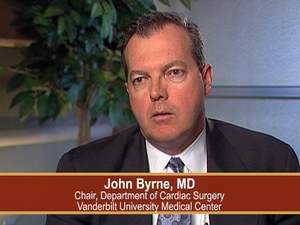 NASHVILLE, TN -- (MARKET WIRE) -- August 30, 2005 -- Vanderbilt University Medical Center is hosting a live webcast from their state-of-the-art Hybrid OR/Cath Lab on September 29, 2005 at 4pm CDT (21:00 UTC). When John Byrne, M.D. joined Vanderbilt University Medical Center a year ago, he brought a novel idea that he hoped would impact the cardiovascular world, much like air bag safety equipment revolutionized the auto industry. Called the Hybrid OR/Cath Lab, the state-of-the-art operating suite houses all the equipment and monitoring devices necessary to perform both open-heart surgeries like coronary bypass as well as percutaneous coronary interventions and procedures, including angioplasty and stenting. A major advantage of this new approach is the ability to perform completion angiography or an X-ray of routine cardiac surgical cases. Traditionally a "before picture" is obtained prior to surgery, but an X-ray study after procedures are completed was not the standard of care. Byrne acknowledges the weight the change will have on the standard of care for cardiovascular patients and is excited about the positive outcomes it can bring. "We wear our seat belts everyday and have air bags. How often does an air bag deploy? Maybe once or twice in your life. I for one am glad it's there when and if it does deploy. The Hybrid OR/CathLab will catch the rare but very important technical errors (if they arise). Just like seat belts and air bags save your life in a car accident." Byrne, The William S. Stoney Jr. Professor of Cardiac Surgery and chair of the department, said most people have no idea that X-rays of cardiac surgical procedures were not performed post surgery. He refers to the new operating environment as "sighted" cardiac surgery. It's an environment that is very dependent upon the work of a team -- which includes Byrne and David Zhao, M.D., assistant professor of medicine and director of the cardiac catheterization lab and interventional cardiology. "This will offer patients, families and referring physicians not only image-guided surgery, but also the ability to provide minimally invasive cardiac surgery combined with percutaneous coronary interventions," Byne said. Vanderbilt Univesity Medical Center's new Hybrid OR / Cath <br>Lab provides better care for the patient, they receive the <br>best of both worlds through the collaboration of <br> interventional cardiology and cardiac surgery.